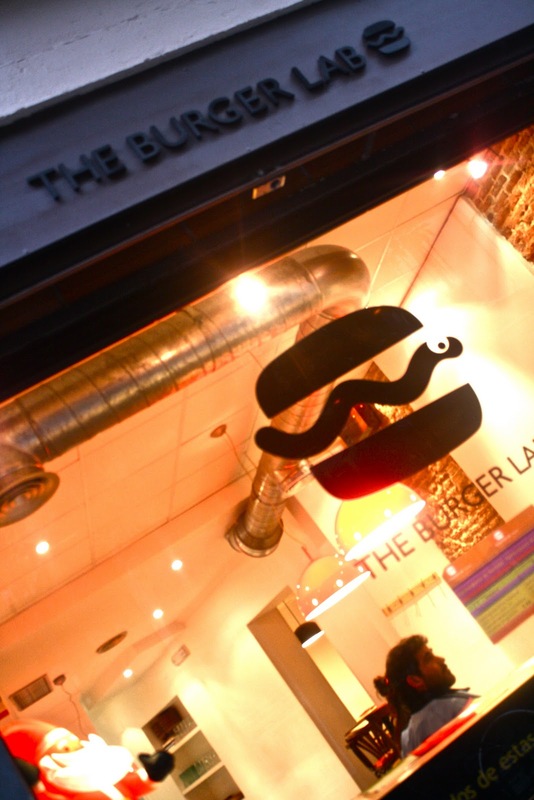 "A hamburger for every taste...A culinary experiment that will surprise you with new flavors..."
This is precisely what you will find at THE BURGER LAB... Madrid´s very own burger joint that takes flavor to another level. How would you like your meat?Exotic or traditional? Adventurous or original? At The Burger Lab, don´t hesitate you have 11 different types of meat or not meat to choose from: ostrich, kangaroo, beef, chicken tandoori, salmon, tofu, pork, and the rest I´ll leave for you to come taste and indulge in. The Burger Lab supports a very humble minimalist design which stands in contrast to the very non-minimal flavors and taste experience found within the burgers. Along with the "out of this world!" burger you decide to order comes a side order of different types of potatoes. If you are not into traditional fries you can also order cubed potatoes, chips, or the famous patatas bravas (potatoes with a creamy tomato sauce) or asadas con ali oli (baked with Spain´s famous creamy garlic sauce). Burgers are small, so if you still are left feeling hungry your indecisiveness from the beginning will soon be cured and you can have both the kangaroo and the ostrich. Not in the mood for Tapa´s tonight, come stop by The Burger Lab and try the hamburguesa de canguru seasoned with tumeric and juniper accompanied by mushrooms, red onions, red cheddar, balsamic reduction and minimalist cubed potatoes ;) !